$150 plus $6 shipping in U.S. I love working with these saturated colors. There is something richly satisfying about laying the groundwork of colors and values, then coming in at the last with highlights that bring everything to life. Awesome! 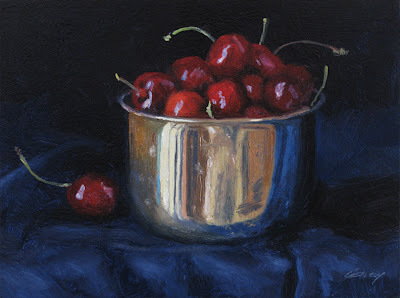 Love the folds in theh cloth and also the reflected light in the bowl and the cherries. Love your challenging *Cherry-helmet*, DON GRAY! Beautiful Don, I love your still lifes as you know. This is so classic with the blue table cloth. Glad you enjoy it, Kristin--thanks. Love this painterly realism. Maybe realistic painterism? Anyway, you're pretty deft with the brush here. Hi Sam, good to hear from you. I like both of your definitions of whatever it is I do--thanks! Jorda - ¡gracias! Tengo el placer de descubrir su bella obra. what is it about artists and their fascination for shiney objects... must be jackdaw syndrome. beautiful! I'm drawn to the all the striped colors reflecting in the pot rather than the cherries themselves! "Jackdaw Syndrome"--Ha, I love it, Rahina! :^) It's true, shiny things are so much fun to paint, aren't they? Thanks for the laugh and the kind word.